It's been a long time since I've shared a craft. This one is super-duper simple and I'm sure a bunch of you have already made something similar. Since Valentine's Day is just around the corner and I love little banners here's what I came up with. Sunday afternoon we went to our local Dollar General Store and I purchased a roll of burlap ribbon ($1.50), a package of jute ($1.50) and a package of felt stickers ($1.00). I'm sorry, I didn't get a pic of the burlap on the roll, so I'm not sure what the length was but I'm thinking 9 yards. 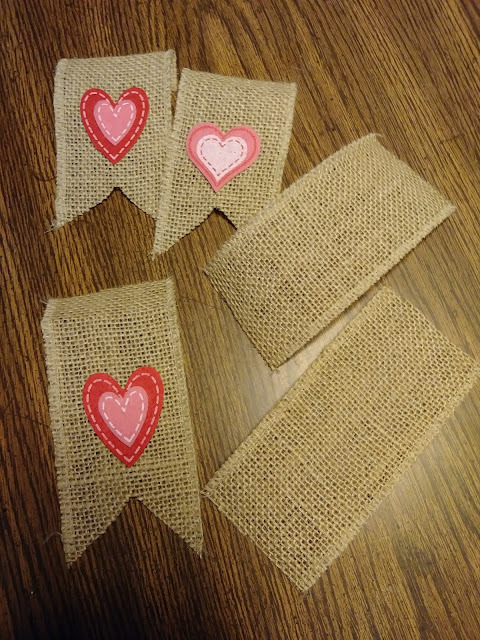 I cut the burlap in lengths of about 5.5 inches, folded and cut a notch in the bottom of each one, peeled the backing off the hearts and stuck one on each of the burlap sections. The adhesive was enough that they stuck really well but should any of them come loose, I'll hot glue them back on. 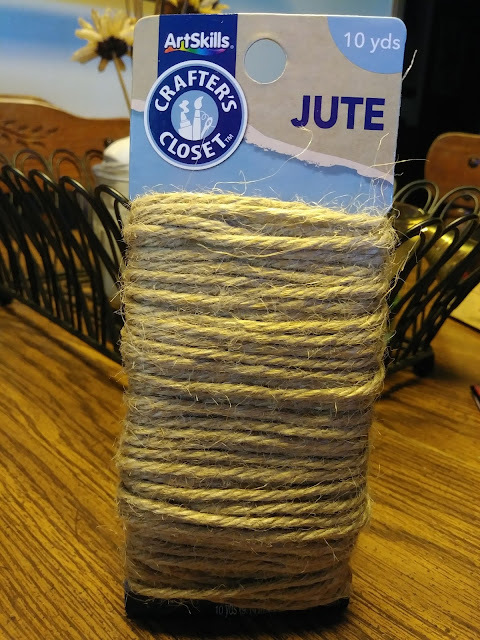 I folded a section of about 1/2 inch on the top of each piece and hot glued it to the twine, leaving about 2 inches between each piece of burlap. Be sure and leave about a 12" length of twine on each end of the banner. Sorry, no pics of this because I'm not coordinated enough use a hot glue gun in one hand and the phone in another. here's the finished product hanging on the bottom of the shelf over our table. I ♥ decorating this shelf for holidays/seasons. I'd love to see what you've been up to! HOPE everybody has a Terrific Tuesday! I love that! Nope, no crafting here, been a little busy with school, lol. 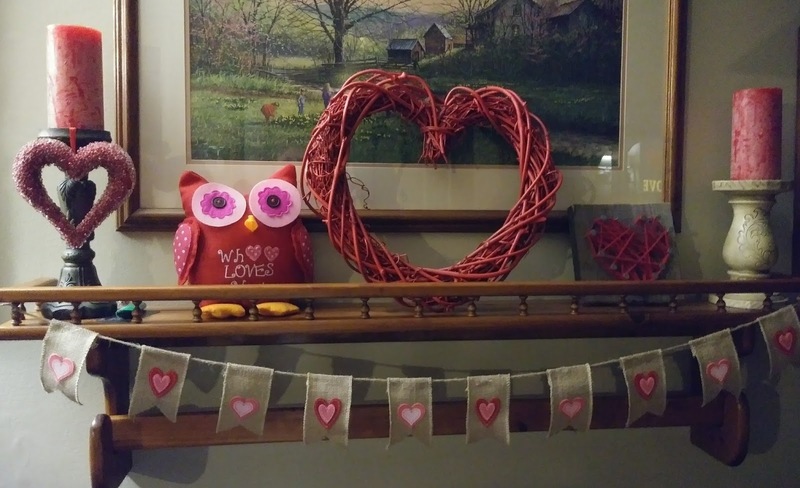 Love your garland...amazing what you can do with just a few supplies. Thanks for sharing, I might have to be a copycat. Hope your week is off to a good start. That is totally adorable and I think even I could do it. I'm currently crocheting a scarf and loom-knitting a hat. I've recently completed a couple other things, except I need to work in the ends and add a clasp to one. Hopefully, I'll get them finished soon and show on my blog and add to the Etsy shop. What a fun project!! I love it! 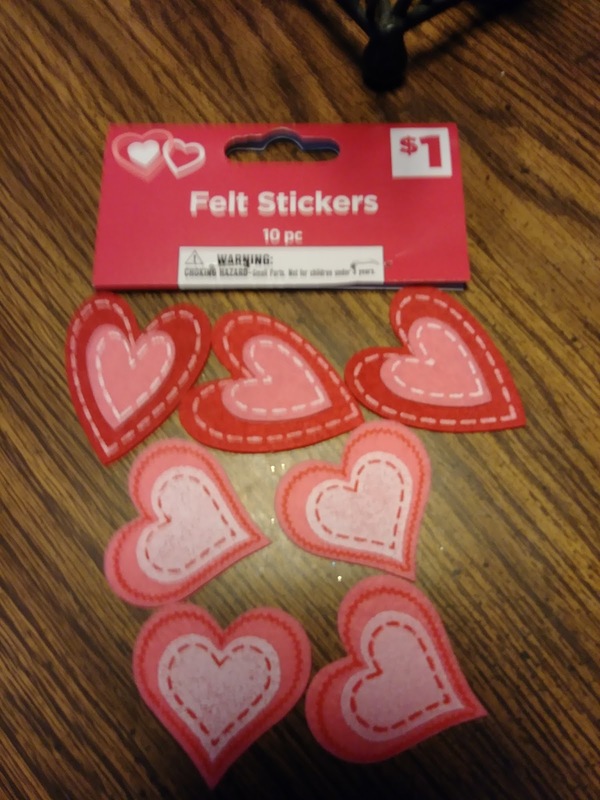 Isn't it great what we can find at the dollar stores (all of them)?! That's a great idea and it looks so pretty.